Factoring is an important concept in Algebra I, and often a difficult one. My pre-algebra class flew through polynomial multiplication, so I decided to give them some exposure to factoring. I was going for exposure more than mastery just so they could have some factoring experience going into Algebra. As my students are young and just beginning to develop abstract thinking, I decided to try more concrete/ visual methods for factoring. Naturally I though of my fabulous Algebra teacher friend who gave me the Math Hunt idea. She swears by factoring with “the box”, especially with students who tend to struggle more. Even though I had never factored using the box, multiplying polynomials with the box was a big hit so I decided to look into it and give it a go! We started with the GFC, how to find it and un-distributing (or de-clawing) it from Polynomials. I made a graphic organizer relating what they knew with what they were learning. I gave them a slew of homework and they SLAYED it. 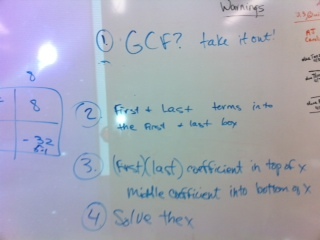 Looking back, I should have also put GCF problems using the box too. It would have helped a few of my strugglers in the coming days. Riding on the good GCF vibes I found a great x puzzle worksheet (more commonly known as diamond puzzles) that I gave to my students. I really, really love the Internet! Some of these puzzles were HARD. But since they were puzzles they LOVED them. Go figure. I then showed them what came to be know in our classroom as “x-box” factoring. Since they were very familiar with polynomial multiplication with the boxes, showing them factoring was almost effortless. Puzzle + boxes = factoring. I had them do a few in their notes so that they would have examples to go by for homework, and then I pulled out a dry-erase template that I made. I printed out the templates and they put them in page protectors. They love anything that they get to do with dry-erase markers (and I will do anything to make factoring less painful) so it was win-win! Just because it went very smoothly for them during practice does not mean that they would remember it. So, after several practice problems I had them write down their own steps to x-box factoring. After somewhat of a rocky start, writing their own steps went REALLY well. This showed me that I definitely need to have them do more of their own step writing in the future. They came up with some great (and very detailed) steps! We combined their steps as a class to come up with a condensed list. Here is a pic I took of their first few steps. The best thing about the x-box factoring is that we stared with the “hard” problems first. Only a few days later did I show them the simple method for factoring trinomials with a leading coefficient of one. Some kids took to it, but most stuck with the x-box. I did not do as many games as I should have this unit. I was too focused on making sure that each student could get the factoring down. I will definitely because (too late) I noticed waning attention on the last day we practiced. A game would have definitely livened things up! I haven’t begun to look for games for this unit next year but @merryfwilliams shared one that she tried called Algebra Connect. More diamond puzzles, worksheets, and activities for factoring can be found here. Happy Factoring! This entry was posted in Pre-Algebra by I Speak Math. Bookmark the permalink. Kristen – I LOVE the “flex-box” name and am so going to steal it. Even though we ended up calling it x-box I felt it was kinda cruel since it was the furthest thing from the x-box. lol! Thanks so much for this! I tried to click on your “dry erase” link, but it didn’t work :<. I created a factoring dry erase template this year too, and, I was curious how they compared! Thanks for letting me know! I am new to box.net. I am not sure if you have to have an account to download but I changed the links. Hopefully it will work now. I would love to see your template.